One of the most photographed historic homes in the highly sought after Point Neighborhood in Historic Beaufort can be found at 303 Federal Street where century old Oak Trees adorned with Spanish Moss, Camellias laden with graceful blooms and flowering Azaleas create a backdrop for grand southern living. Dual Verandahs provide a haven of tranquility with views of the Beaufort River and Tidal Marsh and set the stage where life is defined by the past, the present and the future. Known as the James Rhett House, this 3,781 Sq Ft family home has 3 Bedrooms, 2.5 Baths, newer Kitchen, Custom Library and completely finished "lower level". Stunning Immaculate 4 bedroom residence that epitomizes Lowcountry living! This beautiful downtown Beaufort home offers hardwood floors, custom molding, a gorgeous updated gourmet kitchen, formal dining that opens to a lovely side porch perfect for entertaining and outdoor living space. The main level features a spacious master suite, open living room, large mud room, porches galore, and an endless list of additional features. The second floor features 3 additional large guest bedrooms, reading/entertainment nook and an abundance of storage space. The oversized 2 car garage boasts a lovely finished apartment over the garage. This beauty shows like new. Designed with careful attention to detail, the open floor plan & porches blend indoor & outdoor living essential for lowcountry living. The wow factor is apparent throughout. Enjoy indoors surrounded custom built-ins or the back porch where you can grill, dine, watch TV by the FP. The spacious 1st floor master suite offers 2 vanities, a huge shower, heated floors, & large closet. This low maintenance & energy efficient home provides peace of mind with features like high impact glass windows & doors, spray foam insulation, & tankless water heater. Come and experience this rare find! Gorgeous newly renovated custom colonial style home nestled in the highly sought after Cottage Farm Neighborhood!Spacious yard and beautiful views call for your attention whether it's relaxing on the front porch watching the sunset or taking a quick stroll to the community dock to sit and watch the waterfowl, this is the perfect house! From the moment you step in the foyer you are greeted with beautiful custom reclaimed barn wood oak flooring, gorgeous light fixtures and an open concept. 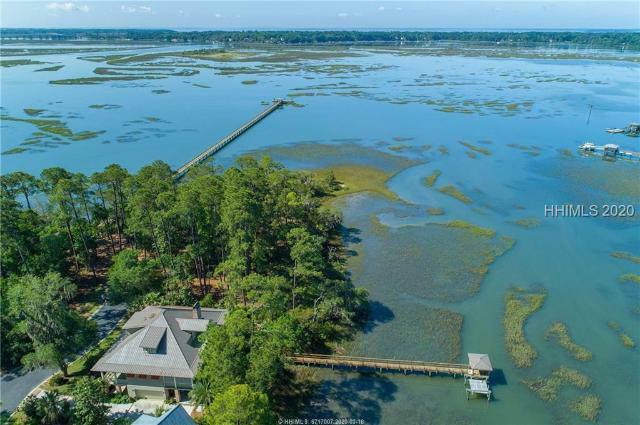 This home boasts an impressive kitchen with granite countertops, farm sink on island, large gas range, ss appliances, Savannah brick backsplash. Classic Low Country cottage with modern touches. Beautifully updated and maintained 4 bedroom, 3 full bath home within walking distance to downtown as well as to the historic depot/Spanish Moss Trail! Versatile floor plan offers both first and second floor master bedrooms with en-suite baths and large closets. Wide planked pine floors create a warm ambience with cathedral ceilings, wood burning brick fireplace and built-ins lead to a beautiful kitchen with brand new quartz countertops and stainless steel appliances. Fabulous fenced yard with gorgeous landscaping, patio and screened porch for your outdoor entertainment and enjoyment! Three large, first floor bedrooms with three full baths and a huge bonus room upstairs. Hardwood floors throughout the first floor with the exception of ceramic tile in the bathrooms as well as the laundry room. The open floor plan features soaring ceilings and tons of natural light. The living area has a beautiful built in and corner fireplace. The kitchen has stainless steel appliances and granite tile tops. The wrap around porches showcase the pond and the fenced back yard. The master bedroom is 16 feet by 14 feet with a large walk in closet. The master bath has a double vanity and separate stall shower and a deep soaker tub. Perfect downtown cottage to enjoy the Beaufort lifestyle. Walk to Bay St for coffee, dinner, and shopping. Quick stroll to the bluff overlooking the Intracoastal Waterway. This move in ready, circa 1941 cottage has beautiful hardwood floors, 3 bedrooms and 2 full baths. The large lot extends to Euhaw St with a rear entrance and plenty of room to add garage/apartment, or accessory building.